I have been a Boulder Flycaster member since I first moved to Boulder in 2004. Born in the Chicagoland area in 1980, I moved west for less people, cheaper adventures, and the dream of starting a business. My reason for joining the BFC was a mix between a passion for catch and release, and also a selfish need to learn how to fly fish for trout. I learned fly fishing in Illinois and Wisconsin. I worked for a sporting goods store in High School and started fly fishing for panfish, then graduated to bass fishing, and finally got my diploma in pike fishing. By the time I got done with college in 2002, I had a bachelors in business with a major in catching fish. When I moved to Colorado, I imagined that I was going to catch big trout all day long…like the trout that you see in the magazines – two handed big jaws. I figured out very quickly that I couldn’t fly fish. I would try with the fly rod for a couple hours, and maybe get lucky and catch one small fish. Then I’d switch over to my ultra-light spinning reel and take my frustrations out on the fish with Rapala treble hooks and Mepps spinners – for a quick 4 or 5 fish slaying (always released). Never did I catch a fish that looked like the ones in the magazines. So, I kept fishing for trout, because there isn’t much else to choose from, and each time I was on the water I would find a fisherman to ask what he / she was using. I learned to use more than one fly from a stranger on the Poudre; I learned to use an indicator from a guy on Clear Creek; but my best lesson was from a fisherman on the Blue who showed me that the proper amount of weight on a nymph rig is just as important as the proper fly. Proper weight was my missing link, after that day, and still today, I will experimented with weight before changing flies. I have been grateful to learn from others, especially strangers, and I am now giving back as a fly fishing guide – enjoying every minute. 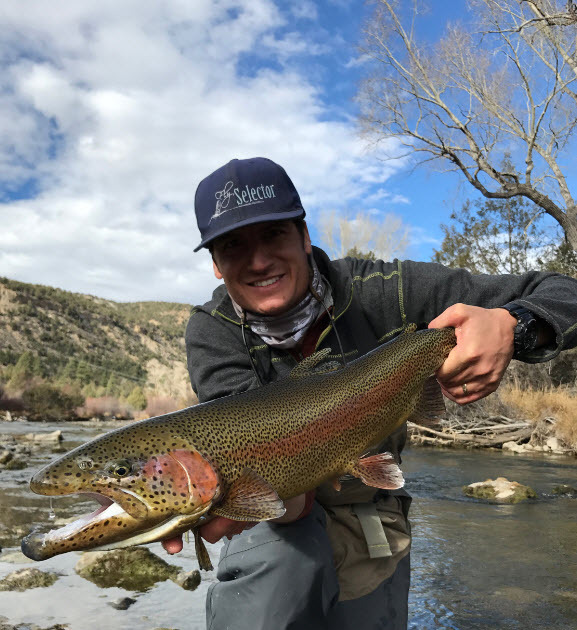 I catch bigger fish than I did when I first started, but compared to what I thought Colorado fishing was going to be when I moved here, and what I know now – Colorado needs help…the world of fishing needs help. Unless you know the secret spots, or go to catch and release big fish water – it’s difficult to find a fish in the 18+ inch range. I look back at old pictures from Boulder Creek, before Barker Reservoir, and there is a picture of a guy holding a stringer of 10 fish, all two feet long. Colorado’s big fish river habitat is limited to flows, controlled by dams, controlled by people who know that water can be sold for money, but don’t necessarily recognize that fishing makes money too. If we had the water of yester-year, and the ethics of catch and release from today, we could bring back and enjoy the wild trout fisheries that once existed. Yes, its the old battle of water. Can we find a solution better than a dam? How can we have free flowing rivers that breed big healthy fish, and also enough water for people to enjoy a hot shower, or a dip in the pool? Feel free to contact me if you would like some help catching trout.